#AmitabhBachchan is busy promoting his first film of 2018, 102 Not Out which co-stars #RishiKapoor. The actor is leaving no stone unturned in the promotions. The megastar began the promotional tour at his favourite game, cricket. The actor joined former Indian Cricket Team Captain Kapil Dev in a conversation about the on-going Indian Premier League (IPL). It was a sight to remember as the two legends from different fields showcased a cute banter during the conversation. This occasion was also the first time ex Indian cricket captain, Kapil Dev turned into the interviewer as he interviewed Mr Bachchan about his Bollywood journey and his upcoming film, 102 Not Out. The all-rounder is very excited about the new song which is being launched. Both Mr Bachchan and Kapil Dev have immense respect for each other and this was clearly visible when they met today. The conversation started with Amitabh talking about his journey in Bollywood and ended with Kapil Dev spilling the beans about his school and college days. 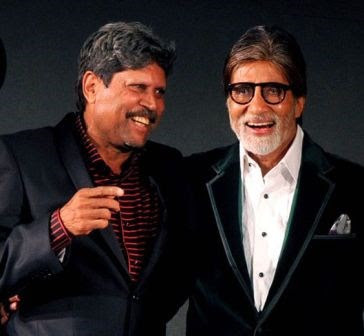 Those present on the sets revealed, "When Mr Bachchan was talking about his journey, Kapil Dev was quick to disclose that he used to bunk school in order to watch him on the silver screen.” On hearing this Mr Bachchan was overwhelmed and both the legends had a hearty laugh. The duo also spoke about Mr Bachchan’s upcoming film 102 Not Out where the actor will be seen playing a 102 year old father to a 75 year old son essayed by Rishi Kapoor. Kapil further revealed that he had seen the trailer of his film and was very excited for the movie.